The Washington Post just published an interesting piece on the next generation of Burma’s political activists. The military Junta controls the sale of SIM cards for mobile phones, pricing them at $1,500. As Post reporter Jill Drew writes, the only way to make a phone call is by using on kiosks pictured below (credit: JD). 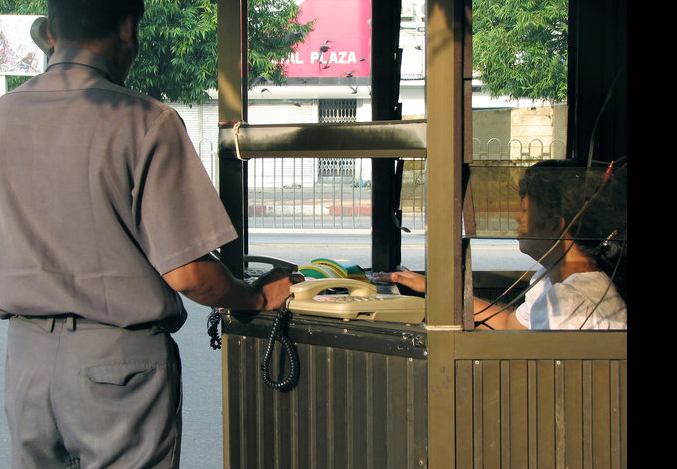 These kiosks are located on street corners in Rangoon, which makes the communication of sensitive information virtually impossible. Nevertheless, The Post argues that activists have been strengthened by the Junta’s crackdown and the post-cyclone bungling. The situation in Burma ties several interesting threads together: digital activism, nonviolent action and disaster diplomacy. In an effort to encourage more multidisciplinary research, I have included below specific excerpts that relate to these distinct but related topics. They operate in the shadows, slipping by moonlight from safe house to safe house, changing their cellphones to hide their tracks and meeting under cover of monasteries or clinics to plot changes that have eluded their country for 46 years. If one gets arrested, another steps forward. Another student said he and some of his peers acted as unofficial election monitors during the referendum, taking photos and interviewing voters who were given already marked ballots or coerced to vote yes. The group has launched a series of creative civil disobedience campaigns. Last year, people were invited to dress in white as a symbol of openness; to head to monasteries, Hindu temples or mosques for prayer meetings. One group of young people decided to organize votes against the proposed constitution, dismissing it as a sham that reinforces the military’s control of the country. So they created hundreds of stickers and T-shirts bearing the word “no” and scattered them on buses, in university lecture halls and in the country’s ubiquitous tea shops. Outside experts have compared the network to Poland’s Solidarity movement in the early 1980s, a broad-based coalition of workers, intellectuals and students that emerged as a key political player during the country’s transition to democracy. Just as Solidarity organized picnics to keep people in touch, some new groups here meet as book clubs or medical volunteers but could easily turn at key moments to political activity. Monks remain politically active, too, in spite of increased harassment from security forces since the protests. Some have hidden pamphlets inside their alms bowls to distribute when they go out to collect food in the mornings, according to a Mandalay monk. They have smuggled glue and posters inside the bowls to stick on street walls. A new generation of democracy activists fights on, its ranks strengthened both by revulsion over last year’s bloodletting and the government’s inept response after a cyclone that killed an estimated 130,000 people two months ago. Meanwhile, the devastation wrought by the cyclone has sometimes been a trigger for more overt political activities. A handful of members of an embattled activist group called Human Rights Defenders and Promoters headed to the delta after the storm to hand out relief supplies as well as copies of the Universal Declaration of Human Rights. They were subsequently sentenced to four years in jail. For more information, please see my recent blog on the Burmese cyclone, nonviolent action and the responsibility to empower. This entry was posted in Digital Activism and tagged Civil resistance, Digital Activism, Nonviolence, Tactical Survival. Bookmark the permalink.